Are you caring for a bed-bound individual? Do you have kids that are constantly getting their hands and faces sticky and dirty? Do you find yourself stuck someplace without access to a sink? When such a situation arises the Care Touch Bathing Wipes will come to your rescue. Use it in place of a bath, shower or sink and still get that fresh, clean feeling afterwards. You can heat the wipes for a more comfortable experience. Warm the wipes for no more then a minute, preferably in 15 second intervals. Test the temperature of the wipes on your inner wrist to make sure it doesn't scald anyone. To use 1 wipe at a time to clean your hand or your face, remove 1 wipe and then make sure to reseal the package so that the wipes stay moist. Keep a package of bathing wipes on hand so that it is handy when you need it. Keep a package in your purse, in your car, at home or anywhere you might need them. The wipes contain no alcohol, are enriched with aloe vera and hypoallergenic and latex free. 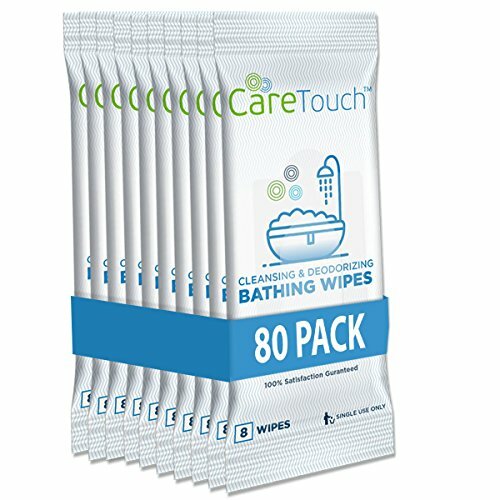 Go ahead and purchase this 80 wipes of Care Touch Bathing Wipes (10 per pack), for that great fresh, odor-free clean when you need it! If you have any questions about this product by Care Touch, contact us by completing and submitting the form below. If you are looking for a specif part number, please include it with your message.